Herman Miller is well known for designing a product that is superior in quality, eco-friendly, and designed with comfort in mind. All of these key elements have been incorporated in the design of these Ethospace workstations. The Ethospace interiors were recognized as the “Best of the Decade” by Design Magazine in the United Kingdom. 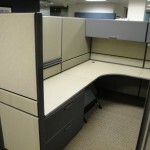 These used office cubicles are comprised of steel frames, which are 100% recyclable that create a base for hang-on components and cover both cable and wiring. Ethospace is a Frame and Tile System with off module capabilities. These capabilities allow for an array of design possibilities within the workspace. Herman Miller manufactured this environmentally friendly office furniture out of 35% recycled content and the entire cube system is 78% recyclable. Herman Miller has engaged in a number of initiatives to promote sustainability which has proven to be cost effective and environmentally conscious. Many of Herman Miller’s products are good examples of ecodesign techniques for achieving sustainability include saving materials, energy efficient manufacturing, recycled content, and recyclable content, including design for reconfiguration. Herman Miller helped fund the start of the United States Green Building Council, hiring architect William McDonough to design a factory adhering to green design principles. 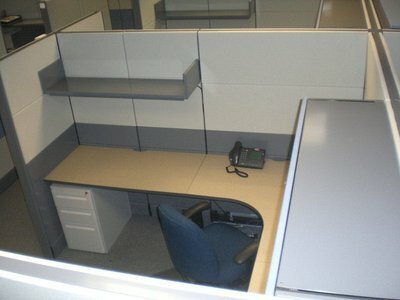 Herman Miller is credited with the invention of the office cubicle in 1968 and is also famous for having partnered with innovative furniture designers Gilbert Rohde, Charles and Ray Eames, Paul Laszlo, and influential fabric designer Alexander Gerard. Herman Miller prides itself on being on the cutting edge of design while maintaining accountability and concern for the environment. 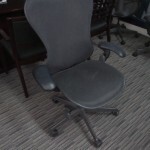 Cubeking has one of the most impressive selections of used office furniture in the marketplace. Recognized for offering superior quality and exceptional value, Cubeking has become the ultimate source for used office furniture throughout the nation. In an economy that is in constant flux, used office furniture has become the most cost-effective approach to staying competitive. Edge band on surfaces: Graphite.